Hope's Cafe: Vidazorb Belly Boost Review and Giveaway! Vidazorb is a company that provides chewable probiotics for both children and adults. I was given the opportunity to review Vidazorb Belly Boost, which is a kids digestive support. These chewable tablets come in a yummy wild berry flavor, and the fun Zorbee character shapes will have your child begging to take this daily supplement! The kids have really enjoyed these, and there's no fussing about having to chew the tablet...probably because the like the berry taste! Address the digestive and immune system needs of children with Vidazorb® Belly Boost™. Clinically substantiated Bifidobacterium, BB-12® and S. thermophilus, TH-4™ are especially kid-friendly and work together to support the wellness needs of little ones. Beneficial probiotic bacteria are essential in helping maintain overall health. *"
While these are obviously designed with young children (4 and up) in mind, adults can take them as well, and get the same healthy benefits! With the winter/cold season already on us, it is important to make sure your whole family gets all the nutrients they need. Vidazorb's Belly Boost is a good way to make that happen! "Vidazorb® heralds a new generation of probiotic formulations that make sense for today's busy lifestyle. Safe, effective, and easy to use, Vidazorb® probiotic supplements are a new way to restore desirable gut microflora for optimal health. Vidazorb®, which delivers billions of live bacteria in chewable formulations that require absolutely no refrigeration, took more than seven years to develop. Why so long? Because Vidazorb® is not your ordinary probiotic. Combining those seven years of research and development with the research conducted on our ingredients, we can confidently say that Vidazorb® surpasses all other chewable probiotic formulations in testing before coming to the market." Vidazorb is giving a bottle of Belly Boost to 5 of my readers!! Sign up for the Vidazorb newsletter. Leave me a comment. 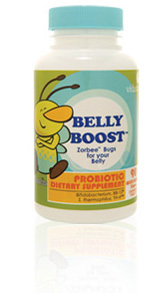 I just entered HopesCafe #giveaway to win a FREE bottle of probiotics from @Bellytweet! This may be done once every 3 days. 2 entries-Refer a friend to sign up for the Vidazorb newsletter. This giveaway ends Thursday, Dec. 30, 2010 at 11:59 p.m. Please leave a valid email address in each comment, as this is how the winner will be notified. Winner will have 48 hours to respond, or another winner will be chosen. Giveaway open to US residents only. Disclaimer:I was not monetarily compensated in any way for this post. All thoughts and opinions are mine. All quotes taken from the Vidazorb website. I entered cafe press giveaway! I entered ceramic peeler giveaway! I entered Auntie Anne's giveaway! I entered Creative Danes giveaway! I entered Sharon Mann giveaway! I entered Bora Bora giveaway! I entered pillow pets giveaway! I signed up for the newsletter. Please enter me. Thanks!